“Art of sharing” is the theme of the 2018 edition the European Heritage Days with a focus on Europe and a highlight on our common heritage, its diversity and consistency. Discovering our national heritage, as European citizens, is an opportunity to think about what brings us together and what makes our singularities. Every year, the volunteers of the Centre d’Animation du Château de Gratot participate to this encounter between heritage and the public by offering a 2 day programme with free access to the Castle. This year, the old stones of the Castle will naturally stage a timeless and original creation by the Théâtre aux champs Company. Also on the agenda: the summer’s art exhibitions, 50 years of preservation and passion retrospective and the historical and architectural journey throughout the Castle. We are in the Coutances area in Thermidor (July/August) of year 2 of the French revolution. Four women in different conditions are to be imprisoned to await their fate. Just four women……not at all alike but in the same state of torment. The first, although a Jacobin, has been identified as a traitor to the nation; the second is simply a noble; the third, an innkeeper, is accused of starving the people; the fourth has been forced by her family to become a nun. All of this is enough for the revolutionary tribunal. The warders obey their orders, the women wait… Each woman’s fate is in the balance. The four women will learn about each other, become closer…..until the last moment. This play is timeless; although the author set it in Cotentin during ‘the terror’, it could take place in any country at war, undergoing revolution. Yesterday or today. Cruel circumstances where individual fates are turned upside down for almost nothing. 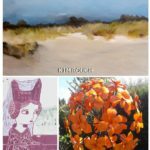 Kim Rouch and his wild landscapes of the Manche region, Mathilde Loisel and the Legends of Normandy as well as Marc Dupard and his emotion sculpture: 3 must-see exhibitions! 50 YEARS OF PRESERVATION AND PASSION … told in unseen archive photographs is a tribute to the commitment and vision of the volunteers who have worked to revive the Château and open it to the public. Volunteers have been able to work through these years thanks to the contributions of visitors and public institutions. Today, more than ever, this help is necessary. Support the action of the volunteers at the Centre d’Animation du Château de Gratot, participate to the preservation of heritage and become an actor of the local culture!